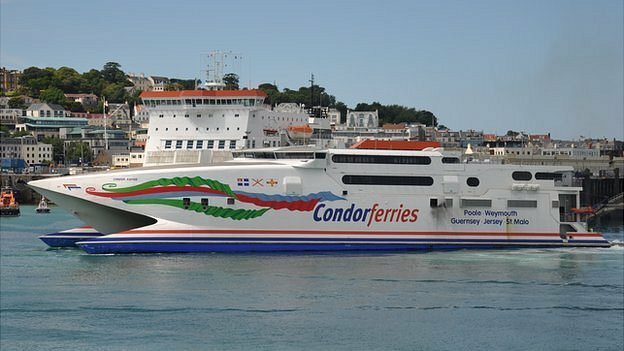 A larger ferry serving the Channel Islands is due to come into service in March, Condor Ferries has announced. The £50m Austal-class vessel was bought earlier this year after the company secured a 10-year licence to operate between the islands and the UK. However, the size of the vessel means the company will stop operating to Weymouth and will only sail to Poole. The 102m (335ft) vessel called Condor 102 will be set up to carry 880 passengers and 245 vehicles. This compares with 741 passengers and 175 vehicles carried by each of the company's three fast ferries. A spokesman for the company, which has experienced a number of technical problems with its current fast ferries in recent years, said it would provide "more comfortable and more reliable travel". With the new vessel Condor Ferries will also be stopping its extra charge for SUVs as well as extending the maximum car length for its standard charge to 5.5m (18ft). The company has also announced the return of day trips between Guernsey and St Malo, France, "at weekends and on popular days during the summer". The company is the only one that operates a passenger service between Guernsey, Jersey and the UK. BRIXHAM EXPRESS has begun trials of a new ferry service between Brixham and Torquay. The first passengers took to the seas of Tor Bay recently to try out the new service across Tor Bay - the first time a year-round service will run across the Bay. But many passengers were disappointed the new catamaran for the commuter service will not be ready until mid December. The new £1.5million custom-built catamaran will cross the Bay in 15-minutes. Until it is in operation, Brixham Express has chartered the Pride of Exmouth boat to carry passengers, but the crossing currently takes twice as long. Mary O'Driscoll from Brixham Express Ltd, who was on board alongside the skipper and crew of two, said: "The new boat is being finished in Donegal. We expect her on site in mid December. But as we have advertised as starting trials today, we wanted to make a start, so we chartered this boat. Around 25 passengers including Torbay Mayor Gordon Oliver and executive head of Tor Bay Harbour Authority Kevin Mowat were on the very first crossing. The new catamaran will be able to accommodate 40 passengers during the winter and 100 during the summer. There will be wheelchair and pushchair access and space to store bicycles. When the catamaran requires planned maintenance, another vessel will be chartered. In the event of unforeseen maintenance being required, a replacement bus service will operate. The company is running free trials from today until Wednesday, and passengers will receive a voucher offering two-for-one entry to Living Coasts, close to the pontoon in Torquay. A single ticket will cost £5 and a return will cost £6. Season tickets will also be available.